I have thought long and hard about the best engine to complement this boiler. In terms of size, era and sheer presence, the Stuart Beam is the obvious choice. The cylinders - what colour? black or green? - are for the water tank/preheater and the exhaust condenser. As for the water gauge, I think it looks fine and don't think it looks out of place. The displacement lubricator hangs on the back, with room to drain it underneath. The lubricators I have used had the steam pipe run through them, with a small hole in the pipe for the oil to rise through, have not seen this style off to the side (I have not seen that many setups, sure that there are lots more types I have not seen yet). Is there any benefit or effective difference between the two types? This one is adjustable, and it works very well, although few people, myself included, know HOW it works! 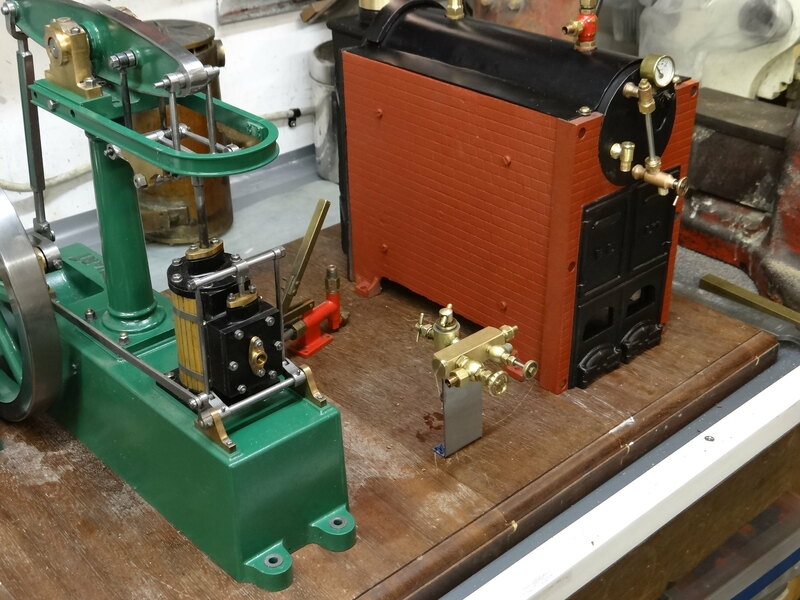 A further refinement is to give it its own steam supply, but that is a little OTT! I have to know where everything goes before I do any plumbing. I am making these tanks from a redundant SS worktop leg that has been in my workshop roof for about 15 years! 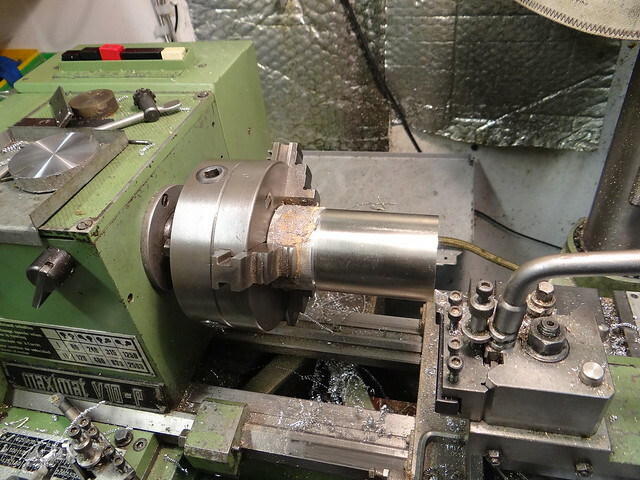 Hacksawed roughly to length, attempting to allow for the 'set' of the teeth on the nasty Chinese blades which sends the cut off at an alarming angle, and machined to length on a push fit mandrel. I borrowed our neighbour Bob's cut off saw to make some alloy discs for the end caps. I just happened to have a two foot long solid alloy bar, just the right diameter! 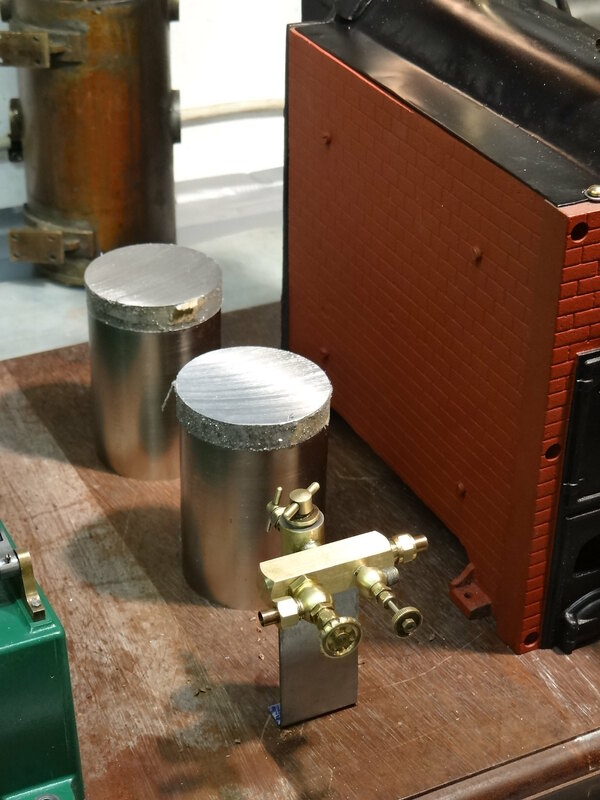 These will be machined tomorrow. ThanksJo. I have seen the first before but not the second! I have remade four of the links, hopefully for the better. The 6BA bolts are nicer too instead of 5BA nuts. The links look a little more 'pompous' than the originals! Very nice, John! It runs quite well. I like the low speed! Really nice runner and a beautiful engine and set up. 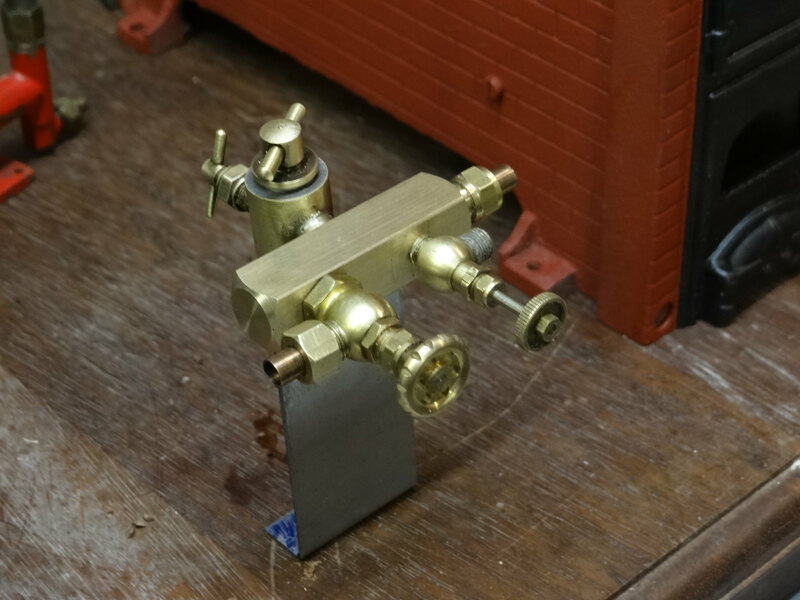 Following some prompting from another place, I've replaced the bit of tinplate holding the manifold with a stanchion. It looks a lot better, and will be even better when I've painted it and the manifold to match the engine. I've been having a go with the buffing spindle. Let it shine! I just have to finish off the (miscalculated) RHS tiles, and nail the thing down! Bad Behavior has blocked 14765 access attempts in the last 7 days.